So, you're considering implementing a customer community. That's great news! There are numerous reasons for brands to adopt a community: some leverage their community to conduct customer research and others use theirs for marketing and engagement. By far the strongest use case, though, for customer communities is as a support channel - with the ultimate goal of increasing customer satisfaction and retention. Customers quickly become impatient with poor service, so customer service leaders must strive to deliver effortless or pain-free support. They also need to streamline the process so it's possible to deliver the right, complete, and contextual answer to a customer's questions. What makes communities so effective is that they infuse 'real' conversations into digital brand experiences. The internet offers boundless opportunities to connect with your customers - and communities let brands harness these opportunities within a single platform. What is a branded online customer community? An online community is an interactive group of people joined together by a common interest. It's also one of the most powerful tools a marketer can deploy for customer retention, word of mouth, and customer insight. 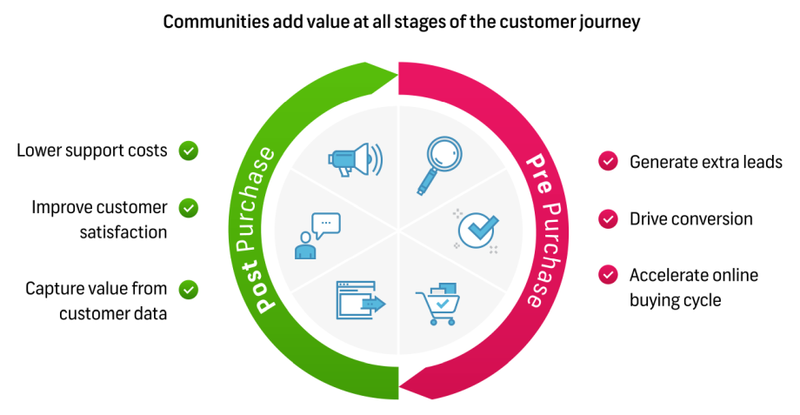 Customer communities have a role to play at all stages of the customer lifecycle. In the pre-sales phase, for example, having a community Q&A can address prospects’ questions and help them make a more informed decision—and purchase!—faster. In the post-purchase phase, communities help you to drive down service costs and improve customer satisfaction by providing customers with a high-quality self-service channel. Some extra traffic? Yes, please! So, not only do communities offer authentic peer-to-peer recommendations and advice, they also help drive potential buyers from Google to your product pages. Research has shown that well-integrated customer communities that embed their content across an entire site or app, rather than remaining siloed, help businesses generate extra leads, drive higher conversion and accelerate the online buying cycle. Everything you need to know about community management and more. You've probably already come across one or two successful online customer communities. Today, online communities powered by customers, product users, enthusiasts and brand advocates play a hugely important role in how we find and gather information. Think of the last time you had a question about your mobile phone contract or a problem with one of your electronic devices. 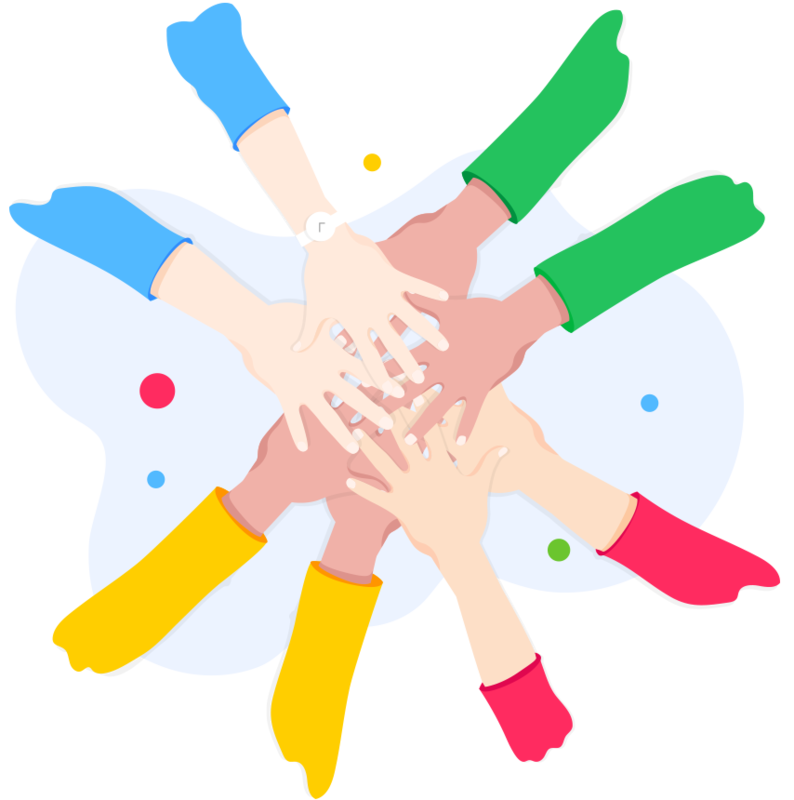 Chances are, you hopped on to Google and it led you straight to an online customer community, where other folks just like you were already discussing the topic and helping each other out. This is the power of communities for brands. The ability for companies to provide a space in which their customers can get their questions answered and their problems solved - at a fraction of the service cost of traditional call centers. How to choose the right platform? Perhaps you've already come to the conclusion that implementing an online community makes sense for your business. Great! But before you dive in and potentially lose your footing, it's first vital to understand what makes a good community thrive. How should you approach building your first community? What do you expect to bring to your business? And what software should you buy? There are a whole lot of options out there, each offering different features, use cases, functionality and integrations. Choosing the right one for your company can be a real challenge. 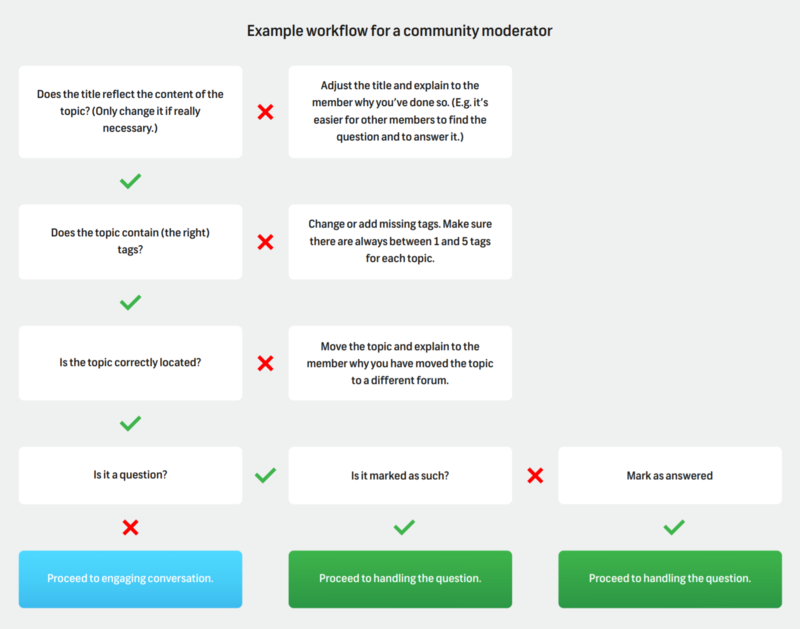 Looking for a full community platform feature checklist? 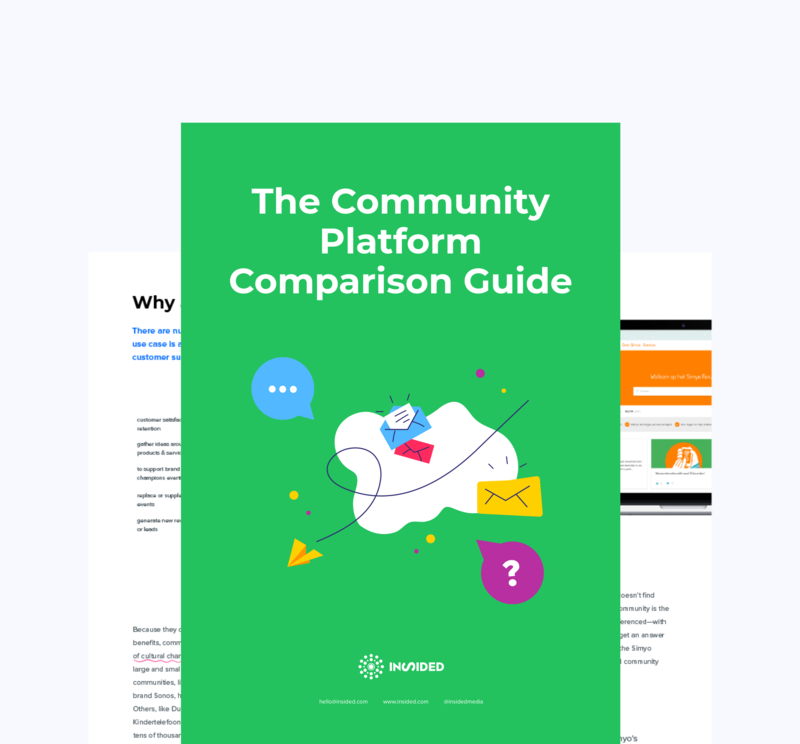 Download your free Comparison Guide Platform today. So, you're pretty certain that implementing a customer community is the right move for your business. It's going to accelerate your online buying cycle, optimize your support costs and increase your customer satisfaction and retention. However, before we jump in, there are a few other elements to consider and plan well before you go ahead and get started. It's critical to define the business case for your community before launching an implementation plan or even selecting the platform you'll use. This secure buy-in and support from your executive board or leadership team, but defining the communities strategic function will guide your planning and rollout agenda - making sure you maximize the return on your investment from the first day your new community goes live . So get to work creating the right community concept. Namely: what should your community accomplish for your users? You will probably opt to support its primary function, but if you also have plans to utilize the community for product ideation, you need to bear this in mind during the vendor selection process. Your desired community concept will determine whether your community can function as a standalone silo — separate from the rest of your website and digital presence — or whether you're better served by a modern community solution that integrates across your entire website, app and external channels , so your users can engage wherever they may be. What functionality do you need to measure your objective? As we touched on briefly above, customer communities can be extremely valuable across a variety of applications—self service customer support, product ideation and development, as well as marketing and branding activities. What's important to note, though, is that the intended use case for your customer community will significantly affect the features you need and the type of platform or solution that suits you best. In most cases, the strongest business case to be made for implementing a customer community is to enable to reduction or service or support center costs and allow customers to get their questions answered quickly, easily and without leaving their existing digital homeland. With this in mind, determine what features you'll need in your community platform in order to achieve your desired community concept and objective. Discussion forums, knowledge bases, gamification ...? The possibilities are (almost) endless! Take some time at this stage to decide whether you are willing to invest a large amount of IT resources and ongoing development costs, with a custom-built platform, or if a flexible, configurable and future-proof SaaS solution better fits your needs. If you decide to custom-build your community platform, you'll enjoy absolute flexibility and control over your functionality and features — but your initial investment will be much higher, and another downside is that you'll fall behind in terms of technological features unless you're willing to invest significant resources into a dedicated development team. On the flip side, SaaS provides you with a future-proof solution - continuous new front end features and improved UX - and no additional budget or resource required. At this stage, you can start to confirm roles and responsibilities — such as which department (s) will handle the community implementation process, and ultimately who will own the community? How will it be managed on a day-to-day basis? Have you already allocated resources internally to take care of the key community roles, such as community managers, moderators and channel managers? Align internally and answer these questions to ensure the community rollout goes smoothly and you are set up for future success. Whilst you won't finalize your launch plan until you've selected a vendor and planned implementation, it's still essential to give some forethought to how best to launch it with a bang. Now is a good time to involve key community stakeholders. A good launch plan would typically involve members of your company's support, marketing, IT, and management teams. Take the time now to align these departments on messaging so that you can maximize traffic to your new community and get a head start with members. Something to take into consideration during vendor selection is the level of support each of your potential suppliers offers at this stage. Will you enjoy working in a partnership committed to your successful community launch and onward growth, or will you be left to fend for yourselves? Want more pro tips for a successful community launch? Grab the Community Platform Selection Guide and get advice from industry experts. Whether you’re actively searching for the best community platform to fit your needs or still considering whether a customer community is a logical strategy for your brand -you’ll find all the guidance you need to make your next step right here. Which community concept does your business need? The concept of online communities has been around for a long time. These digital destinations originated as static forums and message boards (who remembers Usenet newsgroups ?!) and over time have evolved — along with our digital capabilities — into interactive, embedded, gamified and instant solutions for connecting peers wherever they happen to be online. From forum to stand-alone community to a fully integrated online community solution — the range of options available is broad, and it's now up to you to decide which type of community will serve you best. 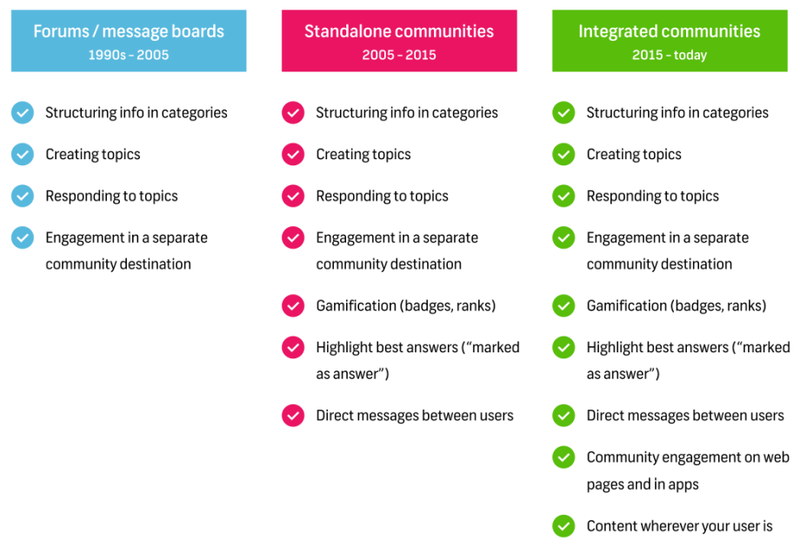 We've put together a handy chart to help you understand just how online communities have evolved over time. Service offerings: Is it a partnership for success? A community platform is just one click away. Community success is not. A vital element when it comes to selecting the right community platform vendor for your business is ensuring that they take the right customer success approach and are committed to working with you not just to launch your community but to continue fueling its growth so you can exceed your business goals. To learn more about the four key areas to focus on when considering which services you'll need your community vendor to offer, download your free copy of The Community Platform Selection Guide. Part two: 3,2,1... launch! Start small, move fast. One of the biggest mistakes brands make when it comes to launching their new community is taking the “big launch” approach. Community managers often mistakenly believe that an effective community is launched with a big bang—from our experience, this is just not the case. Richard Millington, one the leading industry experts on community management and founder of Feverbee, believes that the key to a successful, sustainable and long-term community is to ‘start small’, and our experience at inSided shows the same. Don’t invest budget or resources into a ‘big bang’ style launch – you may see a larger number of initial members, but you’ll struggle to maintain engagement in the long-term and your community may die a disappointing death. Ultimately—maintain realistic expectations when it comes to the speed at which your new community grows. Remember, member numbers don't count —active member numbers do. At the end of the day, you want to run a community that’s strong and successful in the long-term rather than a flash-in-the-pan site that disappears as quickly as it launched. There is no such thing as an overnight success when it comes to community management. 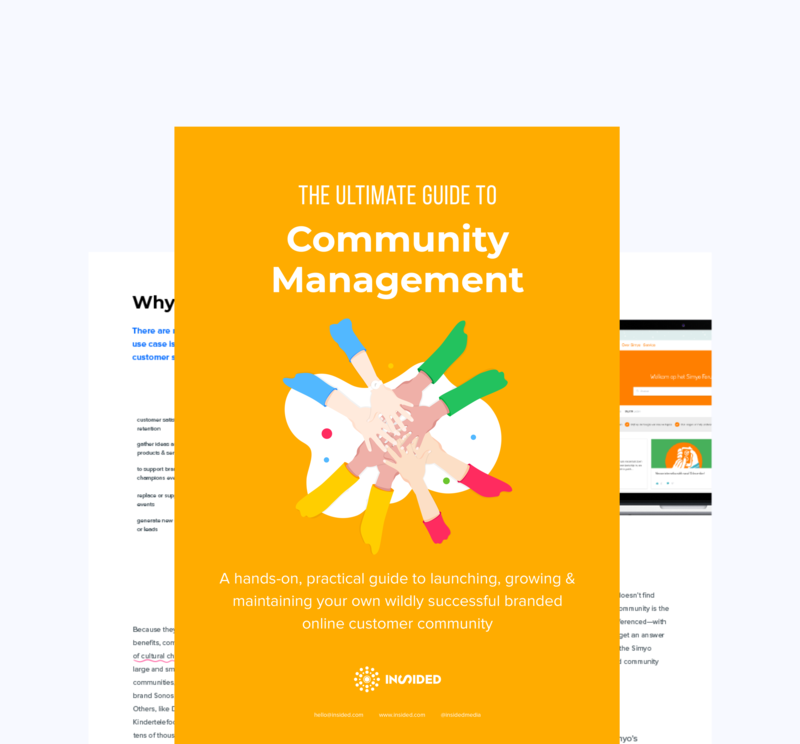 Download The Ultimate guide to Community Management and get the full pre-launch checklist to ensure your community gets started smoothly. Your community needs to be successful on a small scale before it can work well with a larger audience. As long as your community concept is interesting and engaging enough for your initial founding members to truly get involved, you can rest assured that your community will grow successfully. But it’s important to make it as easy as possible for your customers and prospects to become community members—this should be a process that is clearly laid out for them. Keep in mind that before a person can engage in the community, they need to learn about your community, they need to be convinced that they can gain something from visiting your community, and then they need to be persuaded that joining the community is a good idea. While each of these steps will of course vary from person to person, you can rest assured that there are people who are eager to share knowledge or engage with your brand, but who simply don’t know about your community! Make sure that you have a clear overview of all the people that could potentially become community members. So with that in mind, what actions should you take to grow your community? Find out more about how to implement these steps effectively in The Ultimate Guide to Community Management. So, your team is in place and your community is up and running - very successfully, we hope! However, the work doesn't stop there. Maintaining a successful customer community comes with its fair share of tasks. We're going to address some of the big, frustrating jobs that fall onto a community manager or moderator's plate and give you some top tips to transform them into stress-free tasks. As your community becomes more mature, some of the content provided and answers given are of course likely to become outdated. Since you want your community to be a tool that helps people quickly and easily find the right information, you're going to need to take care of any out-of-date content. Get those pruning shears out! TipPro tip: Do not delete old topics or move them to an archive. Why? By doing this, you'll delete pages that have had a lot of traffic over their lifetime and this can lead to a huge decrease in organic search visitors because Google will notice your community's decrease in informative pages. Rather than deleting old content, update the content that is sitting within these outdated topics. Don't panic - we're not recommending you to manually go through and check every single topic in the community to do this one-by-one! 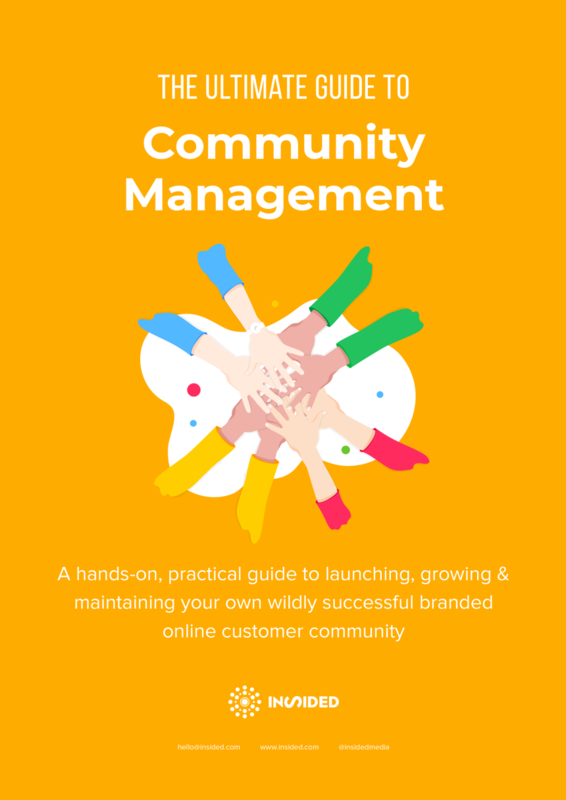 Get the free Ultimate Guide to Community Management and learn the three stress-free steps to update your community content. Dealing with very negative users can be extremely challenging for moderators. Ignoring them is - unfortunately - the best course of action. We advocate addressing negative users and their feedback. Even though you're unlikely to be able to convince a particular user, your reaction will definitely improve the overall situation: other visitors will read your response and appreciate the fact that you are addressing the concern. This benefits your community reputation as well as your company's brand perception. A long reply will restore the trust of your user (and other users who read it), as they'll see you invest significant time in sitting down and reflecting on the feedback. While answering private messages though, it is often a better choice to either redirect the user in question to the public community for further discussion, or to keep your reply as short as possible if you don't want to continue the discussion. If you send a lengthy reply to a private message, expect a lengthy reply back! We're not just talking about the mandatory "sorry to hear that" message here, but about showing some real, genuine empathy when customers are having a difficult time. You can do this by expressing that you relate to how they feel - for example, explaining that you would also be frustrated or disappointed in his or her shoes. As a community moderator, you are a public lawyer or your company. If you surprise users and show that you actually do care (something that - let's face it - most regular users don't expect), then they will appreciate and remember this. This doesn't just stimulate the user to come back to the community in the future, but it also has a positive effect on his perception or your company in general. Even if you think you're unlikely to be able to effect a change, let relevant teams know about any negativity around their subject. More often than you might expect, they'll come back to you with something that your users would like to hear. For more pro tips on handling difficult or negative community users in specific situations - like unhappy customers, missing feature complaints or private message etiquette, grab the free eBook and read in full. Successful communities should immediately begin producing results, and there are three elements contributing to those results: content, traffic, and activation. We’re going to take a deep-dive into the activation funnel and explain how you can use tactics like gamification and superuser initiatives to fuel your community activity and increase member engagement. 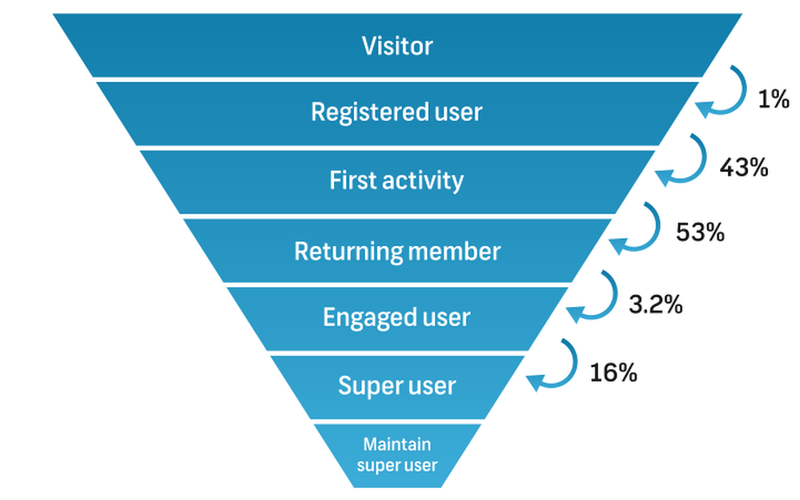 The activation funnel shows why traffic is very important in the initial phase after go-live. The example below includes benchmark conversion rates. As you can see from the statistics, activation tactics are incredibly important to move as many people as possible through that activation funnel and create a healthy group of returning, engaged and super users. These members keep the community alive—without them, there wouldn’t be much content for those people at the top of the activation funnel to come along and feast their beady eyes on! Too many community managers fail to grasp the reasons that users initially join branded customer communities. Believe it or not, your average Joe is not registering out of a burning desire to give back to other people or volunteer their precious free time answering ‘noob’ product questions. They’re signing up because they have a need of their own. One of the ways community managers can go about activating such users and transforming them into active, engaged community members is via a strategic notification email strategy. Traditionally, the default text of community notification emails tends to be rather formal. In the interest of engagement (and keeping things light!) think about what tone of voice you’d like your community to have (whilst complying with any brand guidelines, of course) and adjust your notification emails accordingly. 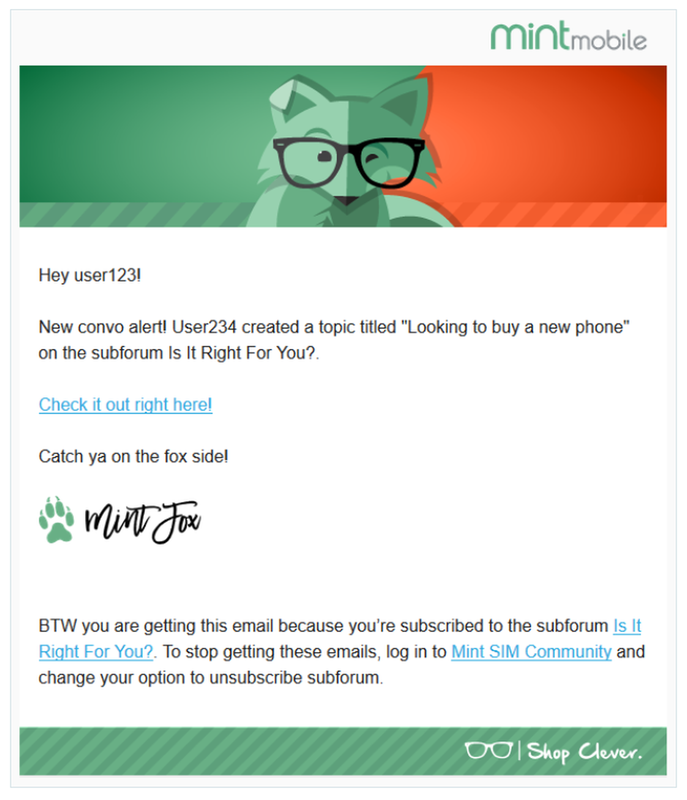 Some communities even have a dedicated "getting started" topic and that's a great addition to your activation email, too! Gamification is a vital element of strong and dynamic customer communities. In order to create and maintain a thriving space, community managers must find ways to incite user engagement. Gamification triggers this engagement by creating moments of user gratification which hook community members to keep coming back for more. As a community manager you’re no stranger to gamification. But are you using all the tools your community platform offers you in order to create a super engaged user base and loyal members? Community managers need to make the most of any features they can that play on their users’ love for rewards, status and ranking, and social validation. Quick refresh: What is gamification? Gamification in a business context refers to the implementation of game mechanics in non-game activities. Not to be confused with actual games, gamification uses the existing infrastructure of a website and adds the engaging functions of games. In communities, gamification is used to motivate and engage the members by creating playful experiences. The motivation for community members can be divided into two main categories; intrinsic and extrinsic. Intrinsic motivation is driven by an interest or enjoyment in a task itself, without any external pressure or desire for reward. For example, a member that comes to the community for intrinsic motivations comes because he enjoys participating in a discussion about specific topics. In contrast, extrinsic motivations are triggered by external factors, such as a prize or recognition from others. Community experiences trigger intrinsic motivations, which are then followed by extrinsic motivations, resulting in an increase in engagement from community members, as well as influencing their customer behaviors. When people are participating in a community for both extrinsic and intrinsic reasons, they are much more likely to display high levels of engagement and participation. Competitions, prizes and gamification systems are a great way to engage members that do not participate, based solely on intrinsic motivations. In other words, gamification enables members to participate not only because the task they are doing is interesting and fun, but also because they are rewarded for it and achieve a certain social status. In turn, it increases the member satisfaction of the community, and increases the likelihood of continued use and contribution. For more ideas about how YOU can use gamification to create your own flourishing online branded community, get your free copy of The Ultimate Guide to Community Management. As we can see from the stats in the activation funnel, we lose a serious amount of members who were once active, but for some reason, fell off the radar. The majority of the time, this is because a user joins a community with a specific question in mind (remember that functional motivation), and once they have their answer or advice, they say adieu and leave the community for good. For a full guide with recommendations on what to share to reactivate your lapsed users, download The Ultimate Guide to Community Management. The strongest communities have a secret ingredient: their super users. 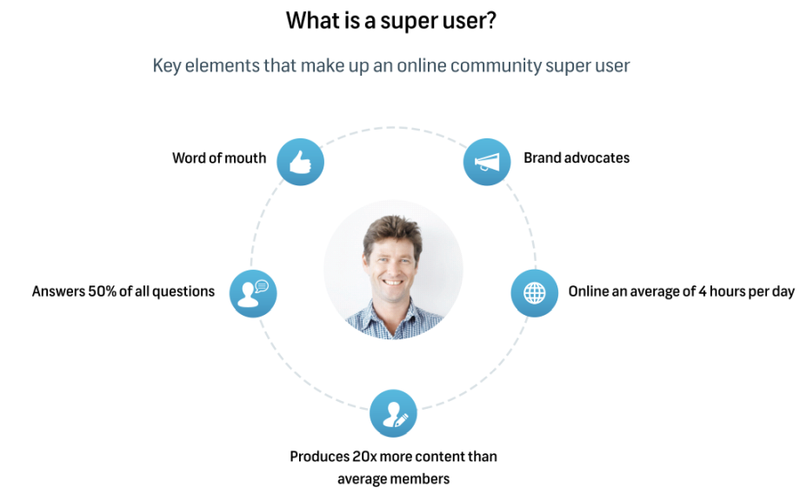 Superusers are a great source of value for your community. They are quick to respond to questions, great advocates for your brand and they keep your community going. If you haven’t already implemented a superuser initiative within your brand community, now’s the time to act! Having a super user program provides a number of benefits for the rest of your community member base. If it’s a formal, openly communicated program, it gives engaged users something to aspire towards—acting as a strong incentive for them to up their activity and step from one activation funnel level to the next. Your super user program also benefits those new and less active members. They’ll benefit from ‘guaranteed’ assistance outside of your company’s regular office hours—often 24/7 when you have a globally distributed member base. This of course contributes to a higher satisfaction level with the community in general and increases the likelihood of new members moving through the activation funnel to become active and engaged users. Celebrate each super user’s milestones e.g. 1000 posts, 100 likes, 100 answers). Celebrate calendar occasions, like birthdays or community membership anniversaries. Schedule regular video chats, with or without an agenda, to strengthen the relationship and gain valuable feedback and insights on your community. Schedule occasional on-site or face-to-face meetings to help super users feel part of a time and more connected with your brand. Get even more pro tips on spotting, engaging and creating long-lasting relationships with community super users in The Ultimate Guide to Community Management. Your community is in place to help your organization achieve its business goals, right? Right! That means you’re going to have to measure and report back on how it’s doing in relation to those goals. Don’t panic! Community analytics isn’t something to be afraid of. Reporting can really help to draw useful insights for your team and boost community growth. Not knowing who your most active users are, or being unaware of the results of campaigns and other community activities is a sure-fire way to waste your team’s resources and miss out on great opportunities to improve the overall health of your community. Not to mention that you’ll be unable to rave about your blinding success to the stakeholder team if you’re not measuring it. It may sound pretty self-explanatory, but first of all, your community needs to grow healthily. This means that you should have plenty of visitors, content and activity. You may think it goes without saying that the content within your community should be valuable to both your customers and your organization, but it’s surprising how much ‘junk’ can build up over time. In the end, you need to be aware of both your community growth and your community value in order to determine what kind of ROI you are getting.As a community manager you must decide which analytical insights are important for stakeholders within your organization. For the ultimate list of community measurement metrics, download The Ultimate Guide to Community Management and find out how to build your reports and show impact and ROI. It’s critical to define the business case for your community before launching an implementation plan or even selecting the platform you’ll use. Not only will this secure buy-in and support from your executive board or leadership team, but defining the community’s strategic function will guide your planning and rollout agenda—making sure you maximize the return on your investment from the first day your new community goes live. Your community concept—namely, what your community accomplishes for your users—will influence the KPIs you choose to track and measure. You have likely opted to make support the its primary function, but you may also have plans to use your community for product ideation and co-creation with your customers. Remember to focus on the concept of impact and not solely on ROI. 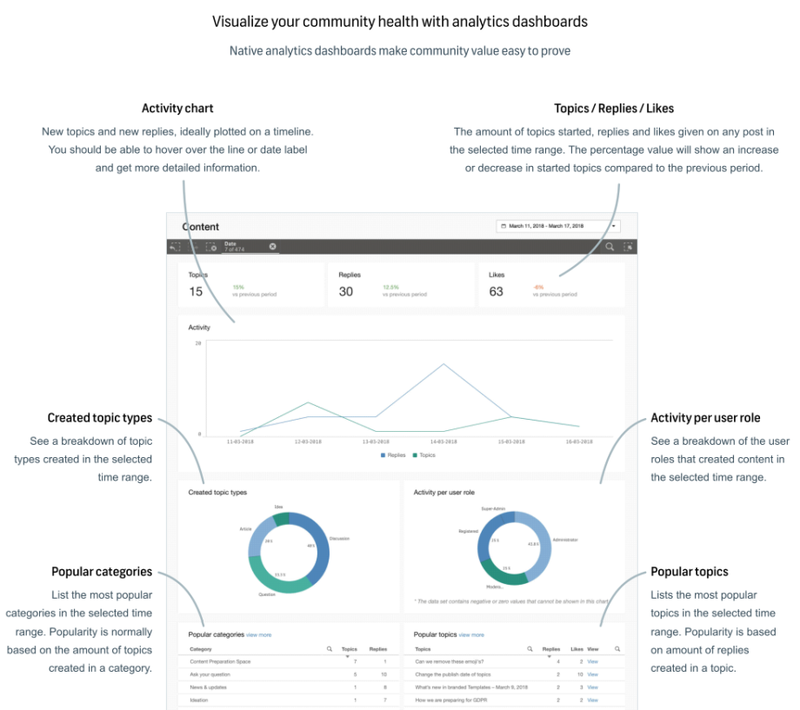 We recommend when compiling your community report (s) to make use of a combination or your community platforms native analytics as well as any external analytics tools you have access to. Google Analytics is a key port-of-call that shouldn't be overlooked (bonus: it's free and easy to use), but some community teams also use analytics tools such as Adobe Analytics (formerly Omniture) and social listening tooling like Coosto or Brand watch. Hopefully, by now you have plenty of inspiration when it comes to ways to prove the value of your community, so let's get into the nitty-gritty or how to work easily with your data and create a comprehensive content dashboard. The exact displays available to you within the back-end or your community platform will vary according to your vendor, but all providers should be able to give you quick and easy exports or the data shown below. Furthermore, data from exit surveys (not shown in the screenshot) is great for measuring call deflections, resolution levels and customer satisfaction. And don't forget to use Net Promoter Scores (NPS) to identify how much your community is contributing to increased brand loyalty, preference and positive reviews. Copyright © 2019 inSided. All rights reserved.